The Chinese were the first people to make and use wind chimes. They were created after the metal bell, sometime around 1000 BC. According to this culture, wind chimes bring GOOD LUCK. Thus, you will often see them hanging near religious temples and shrines, and even inside Asian homes. 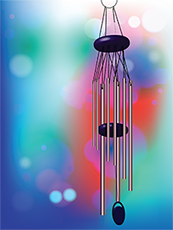 Today, the only school of Feng Shui that encourages the use of wind chimes inside a home is Black Hat Feng Shui. This school of Feng Shui is steeped heavily in the “beliefs and traditions” of the Chinese culture. Wind chimes are used, by other schools of Feng Shu, to move and circulate CHI – outside a property. The goal is to slow down the winds of SHA CHI (fast moving or destructive) energy, so that good energy can gather and accumulate. It’s believed that wind chimes on a North, West and Northwest eve should be made of METAL and on an East, South and SE eve – a bamboo or WOOD wind chime is the most beneficial. Quite honestly, I don’t give much merit to which type of wind chime should or shouldn’t be used. The most important consideration is to add one (or more) if your home is near electrical wires, cable wires, electric transformers, eves of other structures, gets a lot of wind and/or abuts vacant land. If extreme wind is a factor where you live, a wind sock, flag or whirly gig is actually a better placement. In the world of modern day Feng Shui, the goal is to align ourselves with our physical surroundings to create an environment that is conducive to health, happiness, prosperity, and protection. Personally speaking, unless it is part of your culture or religious belief, a wind chime inside a home in the 21st century – is not only useless and tasteless, but it is also the antithesis of good Feng Shui..!